Blade Runner 2049 is an excellent film with stunning visuals that smartly expands upon the world and themes of the original while charting its own course with compelling new characters. That said, as a thoughtful, slow, and deliberate movie that raises a lot of thematic ideas, but ultimately lets you come to your own conclusions, it's not for everyone. 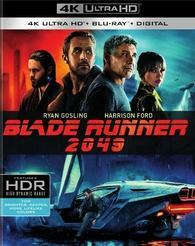 Warner's 4K Ultra HD Blu-ray delivers a truly gorgeous 4K HDR10 presentation (no Dolby Vision on this disc) with an arresting and impactful Dolby Atmos mix. Bonus Features are above average too. Highly Recommended for the movie's fans and anyone looking for a new 4K Blu-ray with fantastic a/v qualities. "I prefer to keep an empty stomach until the hard part of the day is done." Some movies never ever need sequels. Whether or not the film comes to a close with an open-ended finale suggesting that there could be more adventures, some things are better left alone. While I do enjoy the sequels, Rocky never needed another round in the ring. As much as I was delighted and thoroughly entertained by The Sting, I never needed another one. Speed proved you could only go so far with a concept before it completely sputters out. Ridley Scott's 1982 science fiction noir masterpiece Blade Runner never needed a sequel. I didn't want a sequel. But as with most nostalgic properties these days, we got one. With decades of expectations stacked against it in addition to my personal bias, somehow Blade Runner 2049 emerged as an incredible sequel that not only proves its worth but expands and builds upon the foundations its predecessor. K (Ryan Gosling) is a Blade Runner, an assassin assigned with tracking down and retiring late model Replicants who weren't pre-programmed with a built-in lifespan. K himself is a Replicant. More human than human, he is part of a division of the LAPD under Lieutenant Joshi (Robin Wright) whose sole purpose on Earth is to kill those like himself. In this landscape of ecological collapse, K's life is routine. Get up, go to work, kill, and come home to his holographic AI girlfriend Joi (Ana de Armas). Everything changes when K uncovers a mystery so deeply rooted in society that it risks the future of mankind. To find the truth, K must seek out assistance from a former Blade Runner known as Deckard (Harrison Ford) who has been missing for over thirty years. While I won't go so far as to say that Blade Runner 2049 is as good as or better than the original Blade Runner, it gets pretty damn close. So close that the margin of difference is really only quantifiable to that moment of first discovery. As I detailed in my review for the 4K Ultra HD Blu-ray release of Blade Runner, I discovered the film under pretty unique and very memorable circumstances that made me an instant fan of that film. I didn't want to believe that Blade Runner 2049 could even come close to being as good as it is. I was expecting to walk out of the theater thinking "That was pretty good. They didn't screw it up!" In actuality, after sitting through the credits I walked out of the theater speechless, in a stupor. Blade Runner 2049 brought up so many thought-provoking ideas about heady issues and themes like love, having a soul, and what it means to be human that I needed to take a walk for a mile or two to process everything. But the bottom line feeling that was fueling my thoughts was just how incredible the film was. I just couldn't believe that it was actually that good. Round about the same time that Ridley Scott was unraveling his expanded Alien universe with Prometheus, he started early rumblings of a return to Blade Runner. I never took the idea seriously but was intrigued with where it could go. I took things a little more seriously when Scott brought in original Blade Runner screenwriter Hampton Fancher to get cracking at a script. With some help by Logan writer Michael Green, Ridley Scott then took the bold step of removing himself as Director and handing the reigns to Denis Villeneuve. It's when Villeneuve came on board that I actually got a little excited about what Blade Runner 2049 could be. After blowing me away with his thoughtful approach to science fiction with Arrival, and his impressive work with Sicario, Enemy, and Prisoners - I felt that this film at least would be interesting. I didn't expect it to leave me blown away by it. Villeneuve has crafted a visual feast for the eyes. Using a mix of old-school practical effects and models with new digital effects, he created a beautiful yet horrifying landscape that echoes the world presented in the first film, but shows that humanity has stumbled further into a frightful dystopia where it rains all day, snows all night, and the sun rarely pierces the haze that lingers above Los Angeles. Roger Deakins captures every minute detail with wide expansive vistas and long takes that allow your eyes the freedom to wander. With 13 Oscar nominations and no wins, Deakins is long overdue for the Academy recognition he rightly deserves. 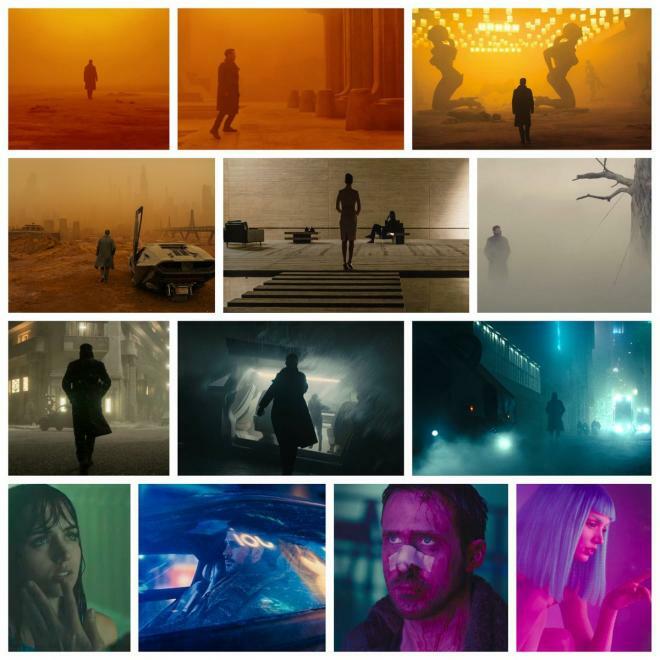 I don't know if Blade Runner 2049 will be the film that nails it for him, but he plays with color, light, and shadow to create a world that is both beautiful and horrifying. Thankfully Blade Runner 2049 isn't all visuals without any substance. What I love about this film is how it runs headlong into thoughtful ideas about the complexities of emotion and how they govern our everyday decisions. The film explores our capacity to feel as a means to define what it is to have a soul and be human. Repeatedly K is told he doesn't have a soul because he's a Replicant. He has feelings and memories, but those are programmed. Conversely, Jared Leto's enigmatic Niander Wallace is a human who is completely void of all humanity to the point that he is more robotic and soulless than the Replicants he creates. There are numerous other examples of this that I could cite and expound on, but I loathe spoilers and don't want to ruin for those who haven't seen this film. That's also why I won't be discussing Harrison Ford's Deckard beyond saying it is a satisfying return for the character and Ford's performance is terrific. But trust me when I say that Villeneuve deftly handles the material and allows the audience time to ruminate on the ideas and come to their own debatable conclusions. Ryan Gosling is also excellent as K. As a replicant, K has a keen and studied awareness of his place in the world. He's valuable as a tool so long as he maintains his "baseline" and remains functional. Once he's no longer of use, he will be like all of the other Replicants he's tracked down over the years and immediately retired. Gosling wears this introspective awareness in every scene as a character who is constantly evaluating his presence and his sense of place. He denies himself base pleasures because he knows he's just a thing. He's not a real human. It's exciting to watch Gosling handle the material when K starts to doubt everything he's been told and begins to believe he's made for more. As iconic as Ford was to the first film, I believe fans will come to know Gosling as K and never doubt that the role was a perfect fit for the actor. Ana de Armas is at his side with a breakout run as the A.I., Joi. She's the only "love" that K knows and there is a magnificent interplay between them. Blade Runner 2049 can feel a bit padded at times. It's not too long or anything, I wouldn't cut any scenes, but there are certain stretches where one can feel the length. Ridley Scott himself has recently come out and said that part of the reason why this film didn't connect at the box office was probably due to its length. Again, I'd say that it is a tad long, but that has more to do with pace rather than length. Some scenes could have been trimmed, but not eliminated. To be honest, I'm glad that Scott didn't direct this sequel. After the middling Prometheus and the messy Alien Covenant, I don't think he would have had the patience to let this film and its ideas breathe in a satisfying way. Scott's films of late feel like they suffer from Intellectual ADD, one interesting idea pops up without being fully explored before jumping to another interesting idea before being dropped altogether and outright forgotten. Even now having seen Blade Runner 2049 nearly a half dozen times, I'm still thinking about it. I'm still processing my ideas and thoughts about the film and various character beats. As Deckard says at one point, "I know what's real." As you watch the film, you're going to have to face and come to terms with your own conclusions about various ideas and the themes the film raises - if you want to. Like the original Blade Runner, this sequel isn't for everyone. For me, Blade Runner 2049 is a titanic achievement. It's the sequel I never wanted but am overjoyed to have. Villeneuve and his creative partners nailed it. Coming out of Sicario I was excited to see what Villeneuve could do with Arrival as the original short story was so short but heady. Coming out of Arrival I knew he was going to do something interesting with Blade Runner 2049. After this film, I know Dune is in capable hands. That said, I don't need another Blade Runner. Sure there is a lot left to explore, but it doesn't need to be. Two films are enough for this little franchise of science fiction masterpieces. Blade Runner 2049 arrives on 4K UHD Blu-ray courtesy of Warner Bros. in a two-disc 4K UHD + Blu-ray + Digital set. Pressed onto a Region Free BD-100 disc, the discs are housed in a standard black 4K Ultra HD case with identical slipcover artwork. The disc loads directly to a static image main menu with traditional navigation options. The included Digital code is redeemable through Movies Anywhere and unlocks a 4K UHD with Dolby Vision on Vudu. As one of 2017 most visually stunning movies, it's no surprise that this 2160p 2.40:1 transfer with HDR10 is simply gorgeous. Flat out, this is demo-worthy material through and through. The colors, the details, the sense of depth and lighting of the film - if you love the Rodger Deakins' work as a cinematographer, you're going to want to come back to this disc, again and again, to soak in all of the imagery. This film was shot and captured at 3.4K but finished at 4K thus this is quite possibly the best Blade Runner 2049 will ever look on disc. A very monochromatic looking film, each location gets a signature color. Future LA oozes heavy blues and greens with deep saturated blacks. The outer reaches of the city has a hazy flat white as if a cloud has permanently settled over the landscape. Wallace's office swims in golden yellows. And the abandoned ruins of Los Vegas swirl in a deep, dusty orange. While you get a sense of these settings in SDR, you get the full-color flavor in HDR. It's because of these atmospheric settings and stylings that Villeneuve and Deakins captured the film at 3.4K. After a certain point, detail isn't going to be much of an issue, and color saturation with strong contrast and black levels take over. To that point, one of the primary quibbles with HDR10 has been the "set it and forget it" variable when it comes to color, contrast, and black levels. Since there isn't a universal standard for this setting, it's simply on a disc by disc basis. Thankfully the use of HDR10 was smartly applied and not overblown. Whites are white without being glaring. Black levels are deep and inky but provide plenty of shadow separation and depth to the image. Colors are well-saturated with terrific primary presence without over saturation. Flesh tones look even and healthy without appearing overly tan as they can sometimes appear in other HDR10 graded discs. That said, it's not quite perfect. It's very good, but if Warner Bros. had included Dolby Vision on disc, this would be as close to perfect as possible. In comparing the 4K Blu-ray to the VUDU 4K UHD presentation with Dolby Vision, the quality of HDR application inches up. That isn't to say that there is some sort of night and day difference that drastically makes DV better than standard HDR10 (and results will vary by display), it's in the subtleties. As Dolby Vision allows the filmmakers to actually fine-tune the HDR grading from shot to shot, scene by scene, you're able to get a more intricate look at the image. For Blade Runner 2049 those primary intricacies are found in the shadows and their impact on color shading. Some shots and scenes it's difficult to spot any real difference, but in scenes that feature deep shadows like Wallace's dark office or Sapper Morton's dark, shadowy home. Where SDR things could appear a solid black, HDR10 showcases some more refinement and separation, and Dolby Vision expands upon those intricacies and gives you more of an even grading from light to dark. While I absolutely love the Dolby Vision application and wish it was available on this disc, I'm still very pleased with the included HDR10 application on the 4K Blu-ray. It's a beautiful image and doesn't come packed in with compression issues or data fluctuations that can arise from streaming. After receiving some inquiries from fans, none of the home video releases replicate the Imax experience. Deakons personally oversaw a 1.90:1 transfer of the film for Imax - and it did look great on that huge screen - but it was not made available for either the 4K UHD, Blu-ray, or 3D Blu-ray release. As I said in my review for the 4K UHD Blu-ray release of Blade Runner, Dolby Atmos adds a lot to the show. To put it bluntly, that is an understatement when talking about Blade Runner 2049. This film was made for Dolby Atmos. It's the kind of movie experience that encourages you to upgrade your sound system and turn up that dial as far as you can so you can bathe in the sonic joy of a smart and balanced audio track like this. From frame one Blade Runner 2049 is a sonic delight. The terrific score by Hans Zimmer and Benjamin Wallfisch sets the tone with low thundering bass notes that echo Vangelis' work on the first film but gives this film its own flavor. Dialogue is clean and clear throughout. Person to person exchanges solid a rich in-the-room quality to them. These exchanges can be particularly jarring and unsettling when K undergoes his baseline tests as words are thrown fast and furious with an increasing intensity. As clean as dialogue is, there are long stretches of silence where no one is talking and all you're left with is atmosphere. Sometimes it's rain, sometimes wind, sometimes it's nothing at all. This Atmos mix handles these variations beautifully with plenty of constant surround activity from every angle. Even in the quietest of moments, there's always something to hear. LFE tones are especially notable for this mix. Along with the previously mentioned score, the sound of spinners flying overhead, the report from K's gun as it fires, these low thundering sounds burst with powerful impact without overpowering the mix or blowing it out. Along with the atmospheric elements, they work to create a fully immersive experience. Levels are spot on as you will never need to adjust when the film gets quiet or louder. However, this is a Blade Runner movie. My suggestion is to play it loud, concern for neighbors be damned. Given that Blade Runner 2049 is a sequel to one of the most celebrated science fiction films ever made, its collection of bonus features is a bit on the anemic side of things. While the quality is genuinely very good and provides an interesting look at the making of the film, you just know that there is more content out there somewhere that didn't make the cut for this outing. I would have loved a commentary track, some more production design features, but what's here is pretty good and I'm glad they included the three short film Prologues that were released prior to the theatrical run of the film. All of the bonus features are found on the included Blu-ray disc. 2022: Black Out (HD 15:45) This animated short from director Shinichiro Watanabe serves to give a little bit of a story foundation behind an important event that is presented as history throughout the main film. 2036: Nexus Dawn (HD 6:31) Directed by Luke Scott, this short expands on a part of the prologue explaining how Jared Leto's Wallace was able to continue production of Replicants and also plants a couple seeds for his motivations in the movie. 2048: Nowhere to Run (HD 5:49) This expands on Dave Bautista's Sapper Morton and how the character became a rogue Nexus 8 replicant. Designing the World of Blade Runner 2049 (HD 21:55) With cast, crew, and creative team interviews, this is a pretty fantastic look at the making of the world of this sequel. While a lot of stuff is covered, 21 minutes feels a tad short for my taste, this could be its own feature-length documentary I'm sure. To Be Human: Casting Blade Runner 2049 (HD 17:15) This is an interesting look at not just the casting of the major players but the numerous small roles that had recognizable actors but featured in small important ways. Blade Runner 101 (HD 11:22) This is a collection of six mini-featurettes that look at the film's world and some of the design aspects. You can watch these individually or through a "play all" function. As they're so short, it's easier to just run through them in a single go. Blade Runner 2049 is the sequel I never knew I wanted or needed. When the prospect of a sequel was first raised, my thinking was "well that could be interesting, but no, I'm good." Then as the production came together and various details came to light, I slowly became more interested but intensely cautious. After leaving the theater on opening day, I learned that Blade Runner 2049 was not only a great film but also one of the best sequels ever made as it smartly expands upon the world and themes of the original and charts its own course with compelling new characters to follow. Simply put, I loved the movie. However, like the original, it's not a movie for everyone. The trailers did a terrible job of selling the film, so those expecting a rip-roaring sci-fi action movie will not get that film. Instead, this is a thoughtful, slow, and deliberate film that raises a lot of interesting ideas, explores them a little bit, but ultimately lets you come to your own conclusions. It may not quite best the original Blade Runner, but it gets damn close. As I consider the original a 5/5, Blade Runner 2049 is a 4.8/5. For now. I know I'm going to be coming back to this film over and over again in the years and decades to come. Warner Bros. delivers a terrific 4K UHD Blu-ray featuring a truly gorgeous 4K image presentation with an arresting and impactful Dolby Atmos mix. The only way this presentation could have been better is if Dolby Vision had been available on disc, but what's here is likely to be the best there ever will be on physical media. Bonus features, while not all encompassing, are still pretty good and above average. If you're a fan of the film, this 4K UHD Blu-ray is an easy one to call Highly Recommended if not an essential piece of your home collection.